A colorful spring-inspired platter of roasted vegetables is the perfect side dish for your seder dinner or any time you are entertaining for a crowd. For this particular mix, I chose a whole head of cauliflower, smaller cauliflower florets in purple and yellow, shallots, Brussel sprouts, and shishito peppers. But the tahini sauce is perfect with any combination of roasted seasonal vegetables you like. We eat with our eyes, so the more color, the better. Note: The tahini sauce can be made at least 2 days ahead and kept refrigerated. Place the whole head of cauliflower in a pot of boiling water for 7 minutes. Remove and pat dry. Place the cauliflower head and all other selected vegetables on a parchment lined sheet pan, drizzle with roughly 5 Tbsp olive oil, and season with salt and pepper. Roast for 45 minutes or until browned. While the vegetables are roasting, make the lemony tahini sauce: whisk together in a bowl until smooth the tahini, iced water, lemon juice, olive oil, salt and pepper to taste. 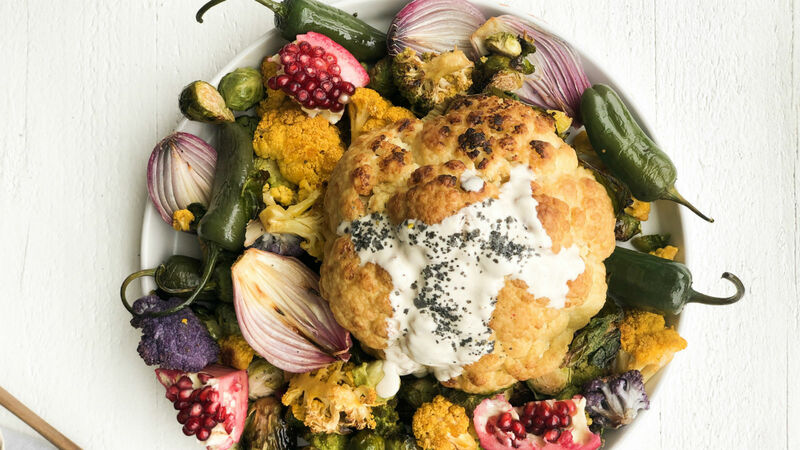 To assemble: place the vegetables on a platter with the whole cauliflower as the centerpiece and drizzle with the tahini sauce. Garnish with wedges of pomegranate for extra color if desired. The rich, nutty flavor of sesame adds a special pop to this creamy dish.